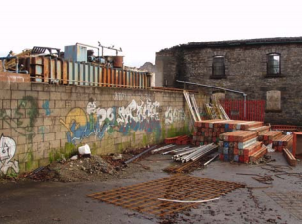 The site in Kendal, Cumbria (plate 1) was formally utilised as a bonded warehouse and timber treatment facility. Elevated concentrations of Tributyl Tin (TBT) have been identified and the believed source is the former timber treatment tank. The site poses a major risk to the surrounding environment due to its close proximity to the River Kent and the elevated concentrations of TBT identified in groundwater across the site. Following remediation, the site has been developed for a commercial end-use. The overall remediation strategy proposed by Envirotreat was designed to address pathway contamination issues, with the intention of protecting surface water and groundwater receptors, namely the River Kent. The remedial operation involved the installation of an Envirotreat Soil Mixed Reactive Barrier System (SMRBS) utilising proprietary E-clays® , comprising both passive and active sections. The objective was to treat contaminated groundwater as it migrates off-site towards the River Kent. The groundwater simulation program MODFLOW was utilised in order to demonstrate that there would be a minimal effect on the groundwater regime whilst effectively intercepting and treating the contaminated groundwater. The SMRBS installation was carried out over a 2 week period, incorporating the installation of both the passive and active sections. Passive sections of barrier are designed to ‘funnel’ migrating groundwater towards the active section of the barrier system, where any contaminants within the groundwater are ‘filtered out’. The Envirotreat Technology was applied at the Kendal site using a Continuous Flight Auger (CFA) system based on advanced soil mixing techniques. Stainsbury Grange provided the plant and equipment and the means of applying the technology, whilst Envirotreat designed the scheme and provided the proprietary technology for remediation.